OSWEGO, NY – The Oswego Opera Theater’s board of directors announces the addition of its newest member, Clarke Warner-Long. Clarke is a native Central New Yorker. He and his wife of 34 years, Mary Anne, currently reside in Oswego County. From left are new Oswego Opera Theater board member, Clarke Warner-Long, with his wife, Mary Anne Warner-Long who is a board member. He received his B.A. in English and his M.S.Ed. from the State University of New York at Oswego. Mr. Warner-Long continued his graduate work in Special Education at Syracuse University and Nazareth College. Through the years, Clarke was employed as a teacher of English, and a guidance counselor in the Northeastern Adirondacks as well as serving as a resource teacher at Oswego High School. During his early career in education, Clarke was employed by New York State in the area of program development for students with disabilities. 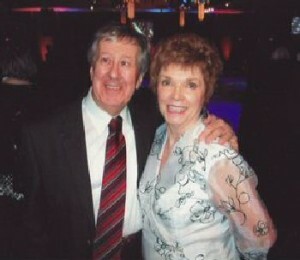 Through the years, Clarke and Mary Anne have attended many cultural performances throughout New York State, Toronto and in the New England states. They are season ticket-holders at the Syracuse Stage and enjoy summer theater productions in the Finger Lakes as well as the performances at Glimmerglass Opera Theater in Cooperstown. Clarke has enjoyed music of all genres, especially the evolution of musical traditions from the 1920s to the 1960s. In keeping with his musical interests, Clarke and Mary Anne are avid ballroom dancers as members of several ballroom dance clubs. They are also members of the Liverpool Community Chorus. With Clarke’s recent appointment to the board of directors of the Oswego Opera Theater, they now share this community service as well. Additionally, Clarke has been involved in on-air radio broadcasting for several years. He has been a regular contributor to talk radio formats locally on WSYR 570 and WOR 710 in New York City and currently co-hosts with his wife a bi-monthly live radio broadcast through WCNY’s Read Out program. This program delivers news, arts, travel and entertainment to listeners throughout the Central New York area who have visual disabilities. He is appreciative for the opportunities that the Central New York area has provided and is eager to “give back” in the spirit of volunteerism through his work with the Oswego Opera Theater.